Although I was shaking in my neoprene waiting for my wave to start, I was fortunate enough to watch the pros swim at Boulder 70.3 2011. 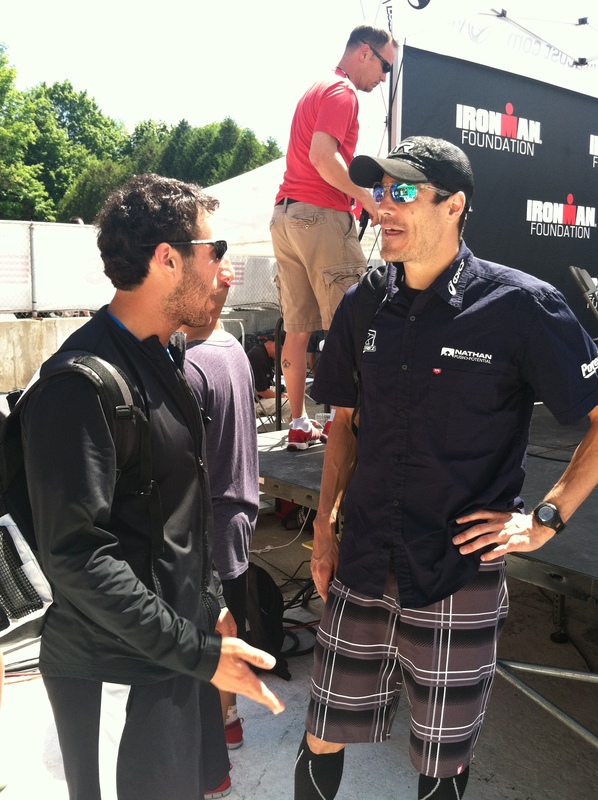 Andy Potts was racing his home course in perfect conditions and was a heavy favorite that day. As expected, he emerged from the water minutes ahead of the chase pack and sped by stunned onlookers en route to T1. Just an hour later, he inexplicably pulled out of the race despite his favorable position on the bike and logged a DNF. Disclaimer: neither Taylor nor I have DNFed to date. Quitting never crossed my mind – I spent the money, I put in the training time, and I will finish – barring injury or natural disaster. Until very recently, I took pride in this statistic, but that all changed at the Great Race last weekend. At no point did I consider taking a DNF, but the GI pain I experienced coupled with its negative impact on my performance served as a revelation: sometimes it’s ok to DNF. This of course depends on your race goals, but in my case, the explanation is simple: there’s no reason to overexert and sacrifice my long term goals for short term pride. What does this mean? In practice, this would mean that if my goal was Boston Marathon qualification, then I would take a DNF at my qualifying attempt marathon if I fell far off my pace. Instead of just finishing and missing my goal, I’d rather have a fighting chance at a fresh attempt soon after instead of going through a full cycle of marathon recovery. If the Great Race fell closer to my A-events this year, I certainly would have considered a DNF instead of overexerting myself and potentially detracting from the bigger picture. Looking back on it now, Andy Potts taught me a valuable lesson back in 2011 and reinforced it again by deciding to not to race Kona 2013. When you have a busy race schedule and long term aspirations, there’s no sense in throwing it all away for one race. I’m not hoping for a DNF anytime soon, but as I set new goals that will require precise execution, it’s important to know when to say when. I think this is a really important topic. There’s a fine line between being a badass and being a dumbass. 😉 There are countless “motivational” messages out there that tell you that you have to reach the finish line no matter what. I personally think that this is at best a foolish, and at worst a very dangerous message. It’s one thing to dig a little deeper when fatigue makes you want to stop. That’s an important skill all athletes continuously try to improve. However, it’s another matter altogether to keep going when it’s just not happening. I DNFed only once, in a marathon, a mere 2km from the finish line, and it was one of the best things I’ve ever done in my running life. It was a very hot day and dehydration seriously got the better of me. I was in a dreadful state and in hindsight, I honestly don’t think I was far off the dreaded IV drip. I was unable to run due to craps all over and despite the heat, I was shaking uncontrollably. I “battled” on for a stupid amount of time, which was just that – stupid. Part of me really believed that I had to finish the race, no matter what. But then I had a moment of clarity, and realised that what I was doing was neither fun, nor healthy, which is why I run in the first place. After that, it was easy to pull out of the race, and I’m so glad that I did. Running isn’t a mindless task, and I don’t run to break my body into submission. I battle with my mind if I must, but I listen to my body. DNF’ing was not at all easy, but sometimes I believe it’s the best thing to do. Excellent points! Could not agree more – running isn’t supposed to land you in the hospital or be unreasonably torturous, especially when you are feeling physically ill. I’m very glad you DNFed instead of risking your health! Good post. Our health is more important than anything. I know for a lot of people there’s a big pride thing involved, but I don’t see a DNF as something negative about my character, under the right circumstances. I was at a conference the other day and they showed us a video of the 92 Barcelona Olympics during the 400 mtrs running competition, one of the competitors pulled a muscle, fell, and couldn’t keep running. He limped all the way to the finish with the help of his dad, and as touching as that was, I don’t see a difference between what he did and just pulling out of the race. You’re absolutely right, sometimes athletes have to stop, whether they’re professionals or recreational runners. There’s so much pride involved in DNFing, but I think the smarter thing is knowing when it’s the right thing to do. I don’t think I could DNF. My very first marathon, I had such IT band issues from my improper training that I had to walk 21 of the 26.2 miles. My feet were bloody messes. But I did not quit. And I’m glad I finished. Wooow. Crazy story. Also glad you finished, despite the bloody feet and lack of training. I’m yet to DNF, but that said, I race rarely so when I race it is a ‘goal race’. My last marathon involved a ‘wall’ that left me dizzy, woozy, shaking and with numb arms/hands, but rather than DNF I stopped, collected myself and walked to the next aid station to rest, fuel and rehydrate and went on to run/walk to the finish. Sure, it was a long way off my PB, but I didn’t have anything else to save myself for so I balanced my desire to finish against damaging myself – a calculated risk that I’m glad I took. However, if I was racing as part of a season and as a means towards a goal race, I would certainly DNF to come back to fight another day. Why risk your larger goal for stubborn pride on a race of lesser importance? Couldn’t agree more. Pride is a huge part of racing, and knowing when you need to just regroup and when you need to pull out is part of the learning process. “Live to fight another day” is a good philosophy to train by. Although I will admit that’s easier to do when you aren’t the one paying your entry fees 🙂 I think some athletes can also fall into a “dammit, I paid for this. I’m gonna get my finisher’s medal” mentality when thinking about the (sometimes ridiculous) race fee they paid. I admit to feeling this way myself. It’s much easier to bail on a $20 5K than a $1000 Ironman. This, mixed in with the training time we dedicate and other sacrifices we make sometimes clouds rational thinking.